Being the holidays, I ended up spending a lot of time watching Japanese dramas. And those, well, they make me crave Japanese food. So one day, while watching Shinya Shokudo, I found myself craving Ochazuke. Ochazuke, or chazuke, is a simple dish, really, and if I had the ingredients I probably could make it myself. It is made with rice served in a green tea and dashi broth. The toppings vary but the typical ones are salmon, tarako (cod roe), ume, nori (seaweed), etc. Not having much luck locating a place that serves it in Pasadena, I dragged a friend to Suehiro Cafe in Little Tokyo. Suehiro Cafe is a popular place serving cheap comfort food like katsudon. I ordered the mixed chazuke with salmon, tarako, and nori for $6.30. While it isn't as 'gourmet' and impeccable as the chazuke I had during my kaiseki meal at Wakuriya, this one is all about slurping it down. Warm, soupy rice full of dashi flavor would hit the spot any day. Oh, and I think tarako adds a great texture to the dish, so I recommend you get that topping next time you try chazuke. Love all these little Japanese cafes that serve comfort food. 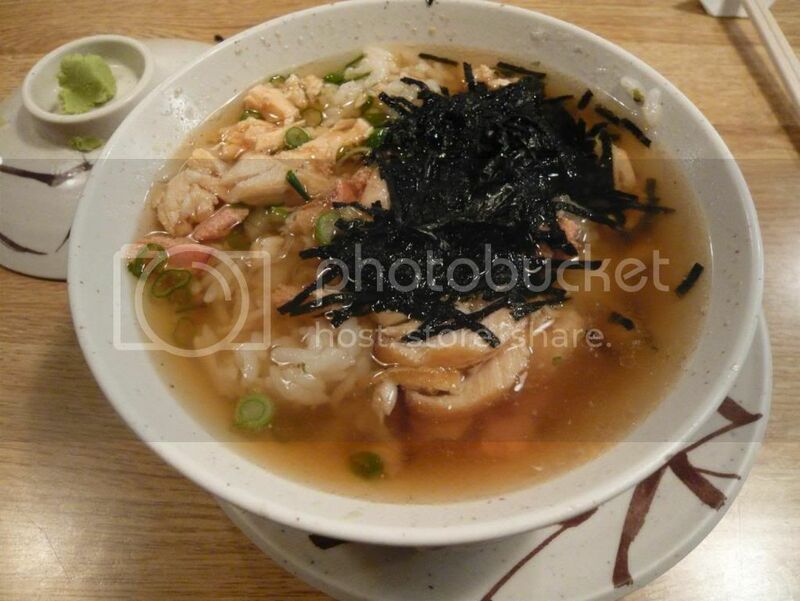 I like Mitsuru cafe for its udon but haven't been to other cafes in Little Tokyo yet. I've never heard of chazuke so this is something new to me :). Sounds yummy on any day though! Never heard of any of these little Japanese restaurants! I'll have to go find them because I love Japanese soups!